Daniela Darquea notched her first victory as a professional golfer at the Symetra Tour's 2017 IOA Championship. 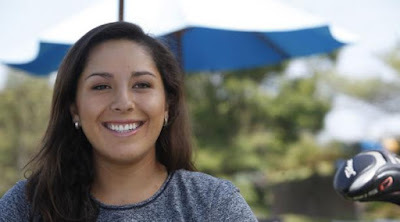 Daniela is from Quito, Ecuador, and was already the first Ecuadorian golfer to earn any status on the LPGA Tour. Now she's the first to post a win on the Symetra Tour or LPGA Tour. Darquea holed out for eagle on the 13th hole of the final round, then, for good measure, added a final-hole birdie. She wound up with a 3-stroke victory. She entered the tournament in 17th place on the tour's early season money list; the victory jumps her up to second place. Darquea did have a previous win in a professional tournament, however, just not a tour victory: She won the LPGA Q-School Stage I qualifier late in 2016. She should get into a handful of LPGA tournaments, but might spend most of her time in 2017 on the Symetra Tour. 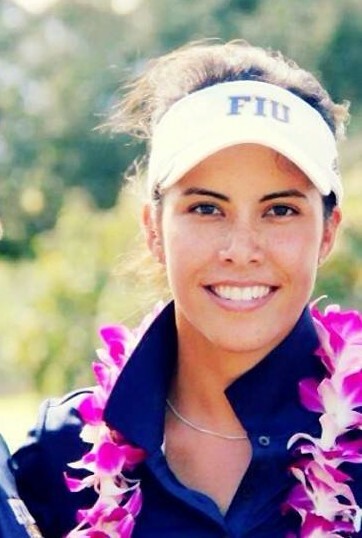 That Q-School qualifier win was after Daniela turned pro following a collegiate career at the University of Miami in Florida. It's not that easy to differentiate oneself in the world of golf trick shots these days. I mean, everyone is doing them. Or at least trying to. So you have to be very good at them, and display at least some measure of creativity, to get noticed now. And Tania Tare keeps getting noticed. Be sure to follow Tania (on Twitter or on Instagram) to keep up with the new stuff.